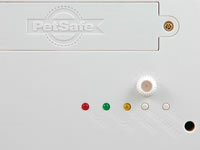 as well as a Limited Lifetime Warranty from PetSafe. 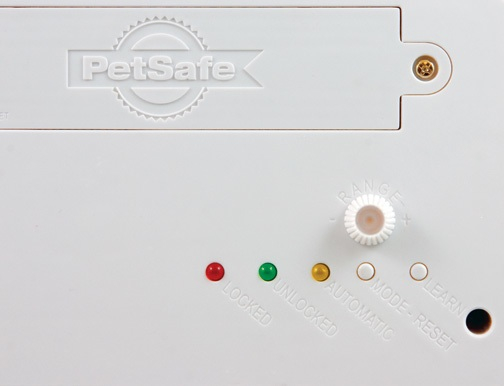 PetSafe's SmartDoors allow you to give your pet a key to your house. 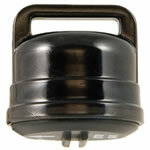 Grant him exclusive access to your home, locking out unwanted visitors. The award-winning Smart Door recognizes the SmartKey™ tag on your pet’s collar and unlocks the pet door. After your pet has passed through, it re-locks automatically. 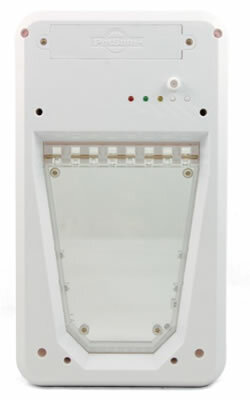 The collar tags have an adjustable activation range of up to 3 feet from the door. Additional keys available for other dogs. Click Here For Cut Out, Flap and Total Dimensions. Sensing range adjustable up to 3 feet.